Turn your records into MP3s anywhere. 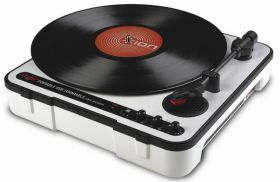 Play your records and make your music mobile, anywhere, with MOBILE LP. 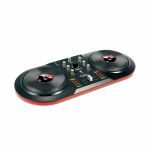 This innovative, portable USB turntable has a convenient USB computer jack enabling you to connect your Mac or PC and transfer your music. You can even connect MOBILE LP to your iPad using a Apple USB Adapter*. Once on your computer, you can listen, make custom playlists, record it to CD, and transfer it to your iPod or MP3 player. The music from your records can be with you wherever you go! MOBILE LP runs on wall power using the included AC adapter, or batteries for total mobility. 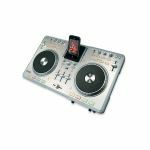 It has a built-in speaker for listening to your records and monitoring your recordings. MOBILE LP also has a line input jack so you can connect other music sources such as cassette decks, and turn your other music into MP3s. ION's exclusive software suite makes transfer and editing your music easy. EZ Vinyl Converter provides an easy way to transfer your music and import it into your iTunes music library. MOBILE LP comes with everything you need to turn your music into digital MP3 files. It has a dust cover with handle, cartridge with stylus, 45RPM adapter, cables, and slipmat. Pick one up and start enjoying your music anywhere you go. - Turn your vinyl into MP3 files or record them to CD. - Built-in speaker for playback. - Operates with either plug-in power or batteries. - Protective dust cover and integrated carry handle. - Fits into a standard 12-inch record case. 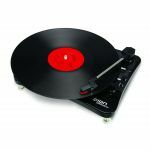 - Plays all standard vinyl records up to 12-inches: 33, 45, and 78RPM. 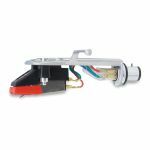 - Belt drive motor with +/- 10% pitch control. - Line and headphone outputs. - Works with iPad and iPad 2 via Apple USB Adapter (sold separately). - Cartridge with pre-assembled stylus.